This is located in Campaigns > Edit This Campaign > Order Settings > Coupon Codes. You can offer special prices and discounts by creating Coupon Codes. Coupon Codes can be made applicable to the entire order (all items in a transaction), or be limited to only specific items/activities within the campaign. To add discount codes, toggle "Add Coupon Codes" to Yes. Enter your coupon code title - The Coupon Code Title is itself also the coupon code that needs to be entered verbatim in order to redeem it. You can set it to either a percentage discount or a set dollar amount discount. 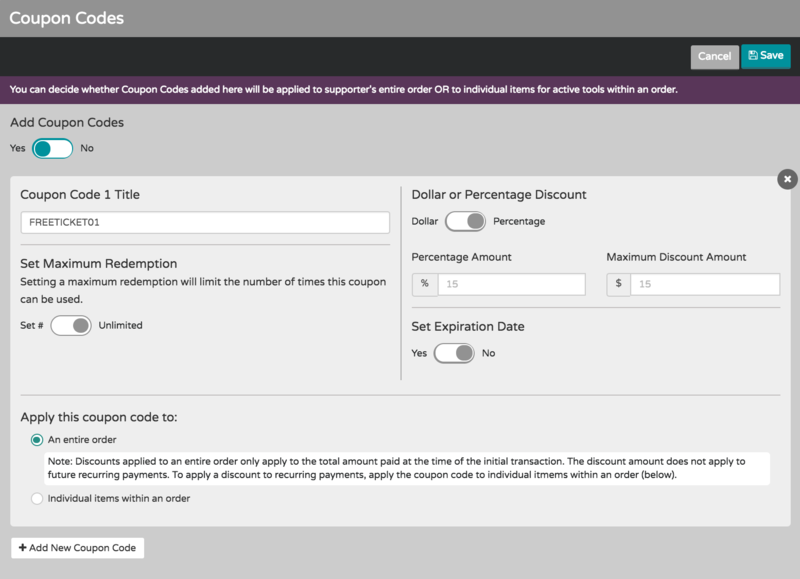 You can also limit the max discount in case of a percentage, limit how many times the code can be redeemed, and set an expiration date for the coupon. These are all optional. Finally, you can choose to apply this coupon code to the entire order, or limit it to individual items within the order. If you choose to limit it to only certain items, an overlay will pop up where you can select which item(s) are eligible for this Coupon Code. Only items that have already been set up and published in the campaign will show in this view, so be sure to set up all of your available items for purchase (including donation levels) before setting up individual coupon codes. You can also set up multiple coupon codes, each with its own settings and eligible items. Click the "Add New Coupon Code" toward the bottom of the section to add more.